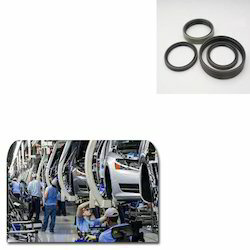 Our range of products include hydraulic rings for automobile industry. We offer Hydraulic Rings for Automobile Industry. Our variety of light rings is planned with the use of premium quality components. Rings offered by us are highly sought after in the automobile industry for such features as smooth finish and lasting service life. This special range is offered at reasonable prices and on time to our clients. These rings have high viscosity property that enables to transmit applied stress uniformly in every direction. By acting as a barrier, these rings prevent the leakage between the sealing surfaces. Also offers resistance to compression set or residues deformation. Looking for Hydraulic Rings for Automobile Industry ?